Showcase Windows are made in Houston, for Houston. Their windows are made with strong vinyl designed for Texas heat. We offer the 143 Window Series from Showcase. Learn more below about what Showcase says about their Earthwise 143 Impact Window, Single Hung Window, Glider Window, Picture Window, and Casement/Awning, and Neuma Doors. When you schedule your in-home estimate, we will go over all of these options in details, and you will be able to see the windows in person. 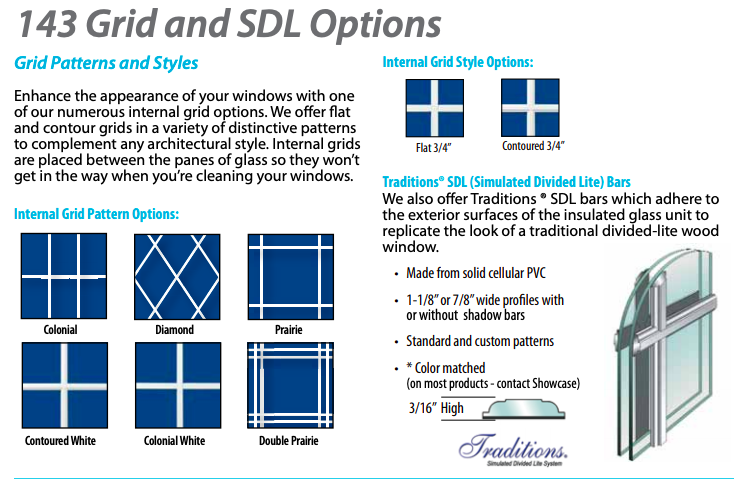 Different windows in this series have various color options, including black and bronze, and also different grid options. We can see which of these options will best fit the needs of your home! “Laminated Glass may crack under pressure, but tends to remain integral, adhering to the plastic vinyl interlayer. "At Showcase Custom Vinyl Windows and Doors, we take the weather seriously. Our hurricane windows are manufactured in Houston, Texas, and are sold to dealers throughout the Gulf Coast region. We understand how brutal the weather can be in coastal regions and we manufacture our Impact products accordingly. Showcase hurricane windows and doors have been tested all along the Gulf Coast, against some of the toughest hurricanes the United States has ever seen. Our Impact products have performed well, withstanding the likes of Hurricanes Katrina, Rita, Ike and others. (To see how one home with Showcase Impact windows withstood Hurricane Ike click here.)" The Earthwise 143 Single Hung Window provides a lifetime of reliable, trouble-free operation. It also offers a very high level of energy efficiency for your home. Best of all, the 143 Single Hung windows is an Earthwise window manufactured for optimum performance in the Gulf Coast region by Showcase Custom Vinyl Windows and Doors. Earthwise windows are guaranteed to last a lifetime and will improve the comfort and appearance of your home. Make The Wise Choice™. Choose Earthwise windows and doors. The Earthwise 143 Glider Window provides easy horizontal sash movement. This sliding window is a practical alternative for locations where normal access may be difficult, such as above kitchen sinks. These windows glide smoothly from side to side. They also let in plenty of fresh air and open for easy cleaning. Earthwise 143 Casement/Awning Windows provide excellent structural and thermal performance in a design that is modern, functional, and easy to operate. Earthwise awning and casement windows are guaranteed to last a lifetime and will improve the comfort and appearance of your home. Make The Wise Choice™. Choose Earthwise windows and doors. The Earthwise 143 Picture Window provides maximum visibility and unobstructed views. Picture windows can also be mounted to the top of a Single Hung, Double Hung or Casement window in “transom” fashion to provide extra height and additional light. The Earthwise picture window is the best choice for homeowners who desire a large, unobstructed view of the world. All of our Earthwise windows carry a Limited Lifetime Manufacturer’s Warranty along with the Good Housekeeping Seal’s two-year, money-back guarantee. Make The Wise Choice in windows with this superior Earthwise picture window built by Showcase Custom Vinyl Windows and Doors. Neuma fiberglass doors have an advanced Hydroshield Technology that protects every Neuma patio door system from water infiltration on all sides. This prevents warping, delamination, rotting, and the development of mold and mildew. All Neuma fiberglass doors contain composite jambs that provide incredibly high impact protection and water protection. This prevents warping, splintering and rotting. Each Neuma door system includes compression molded, fiberglass door skins that resist corrosion, rotting, splitting, and cracking. Neuma doors use a patented, composite-edge design structure to prevent water from seeping into the door and causing delamination and warping. Thank you for your interest in Guardian Windows!